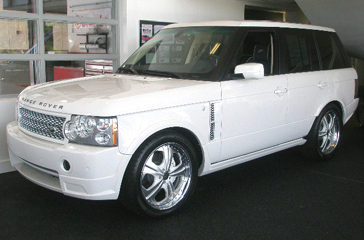 Here is Jason Taylor’s White Range Rover Supercharged with 22″ CEC C721 wheels. The wheels are custom painted white along with brushed aluminum – but a little too small. This Range also has a sick Kahn Body Kit – beautiful. And the white brembo brakes are a nice touch.